More than 260 executives from the across the country were in attendance for the second annual “Innovation Summit,” presented by Niagara University’s Food Marketing Center of Excellence. The event, which was held at the Adam’s Mark Hotel in Buffalo, N.Y., took place Thursday, April 19. 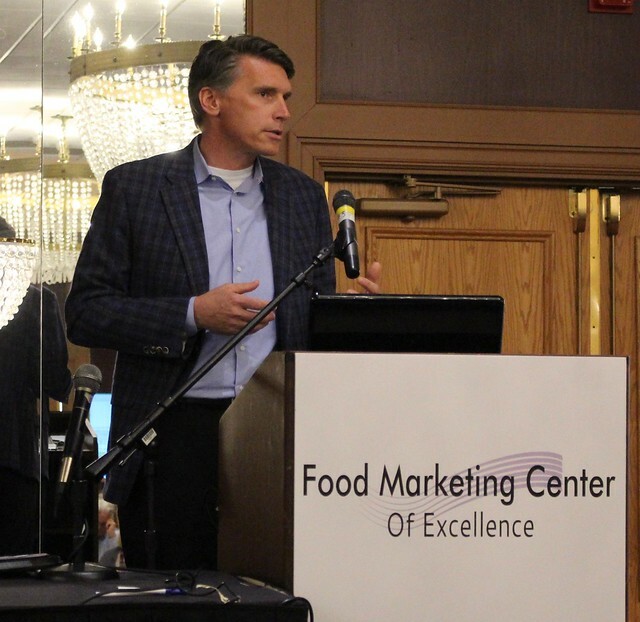 The event was put together by the Food Marketing Center of Excellence (FMCOE) Industry Advisory Board, made up of key retailers and consumer packaged goods manufacturers on behalf the Niagara University food marketing program. The program, now in its second year, has been drawing students interested in a career in the food industry. The Innovation Summit brought together a never-before-assembled panel discussion, with leaders from the top retail and manufacturing companies in the country, including Kurt Schertle (chief operating officer, Weis Markets), Mike DeCory (senior vice president, Wegmans Food Markets), Ian Prisuta (senior vice president, Giant Eagle), along with CPG veterans Larry White (vice president of sales, Dole Foods), and Jamie McKeon (vice president of marketing, food service division, Rich Products). The lively panel was moderated by Kevin Coupe, and key topics affecting the industry were covered. The discussion also included engaging audience participation. Preceding the panel discussion were presentations from key industry experts Neil Stern (senior partner, McMillan Doolittle LLP), and Mike Urness (founding partner of Seurat Capital and managing partner at The Seurat Group). Kevin Coupe (Content Guy, MorningNewsBeat.com) opened the program and set the tone for an afternoon of great dialogue. These leaders provided unique and cutting-edge perspectives for growth and leadership. Throughout the afternoon, event attendees were able to gain insight on trends and the challenges facing the industry. The experts provided a master blueprint of how to compete and win in today’s hypercompetitive environment. Some of the key takeaways included how to leverage omnichannels, e-commerce, data analytics, category transformation, and fresh solutions to meet the needs of the rising Millennial and Gen-Z consumer. One of the most talked about topics – and one the entire panel agreed on – was the future need for a talented and focused workforce that would have the skills needed in the challenging environment, as well as the importance for companies in the industry to have access to graduates from programs like the Niagara University’s food and CPG marketing program. The gold sponsors for this year’s event were Rich Products Corporation, Tops Friendly Markets, and Wegmans Food Markets. Silver Sponsors included Acosta and Upstate Niagara Cooperative Inc. The lunch sponsor was Perry’s Ice Cream and the cocktail sponsor was Rosina Food Products. To learn more about Niagara University’s food and CPG marketing program, please visit www.niagara.edu/food-and-cpg-marketing.